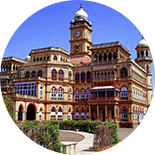 Gujarat is a prominent north-western state of India. 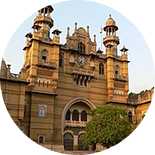 The state has a rich history and is revered for being the birthplace of several notable people such as Mahatma Gandhi, Sardar Vallabhbhai Patel, Vikram Sarabhai, Azim Premji, Narendra Modi, Ratan Tata, and the Ambani brothers. Gujarat alone contributes almost 20% to the country's total industrial output and is one of the most industrialized state in India. The state encompasses sites of the ancient Indus Valley Civilization such as Lothal and Gola Dhoro that are a must visit for archaeology students. 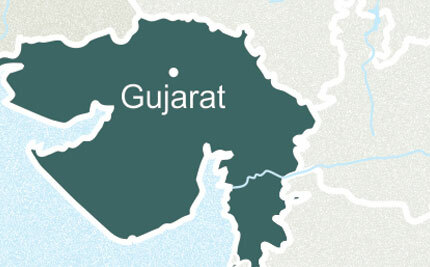 Medieval Gujarat was ruled by several Rajput and Mughal kings. The influence of these dynasties is mirrored in the state’s diverse cuisine, demographics, and different architectural styles of heritage sites, temples, and ancient monuments. 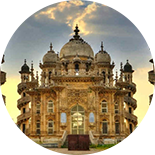 Gujarat - a radiant state that is a trousso of treasures hidden from the tourist. 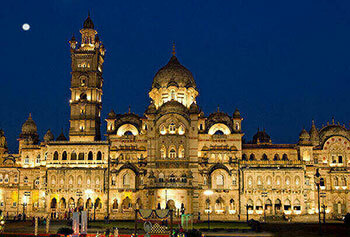 Remarkable architecture, the vibrant culture, traditional textile & handicrafts, scrumptious food, and unique wildlifemakethis state special. A paradise for the spiritually inclined, Gujarat is dotted with many sacred Jain and Hindu pilgrimage sites. Various rivers run through the state, the prominent ones being: Sabarmati, Narmada, and Tapti. 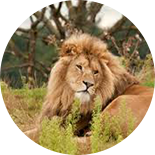 These rivers support a variety of ecosystems that are a breeding ground for different plant and animal species including the famed Asiatic lion, an endangered lion population. The state has been the flag bearer of India’s wildlife conservation efforts and is home to various wildlife sanctuaries and national parks. Gujarati hospitality is world famous. Locals welcome guests with open arms truly embodying the Indian spirit of Atithi Devo Bhava (the guest is equivalent to God). 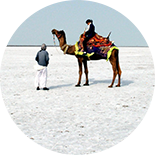 The Rann of Kutch, the only large flooded grasslands zone supports a variety of ecosystems that are home to various endangered and endemic plant and animal species. If you are a foodie, we guarantee you a gala time in Gujarat. The state is known for its varied vegetarian cuisine. From soft dhoklas to thalis, a rich blend of different flavours, the state has a variety of gastronomical delights that ensures you will never run out of reasons to indulge. Ahmedabad, Surat, Bhavnagar, Vadodara, Dwarka, Bhuj, Jamnagar, Junagarh and Rajkot are some of the most promiant cities & towns here. Ahmedabad is one of the most developed metro cities here but simultaneously beholds the traditions tight. The place is known for its culture and heritage and historical monuments. 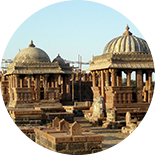 Even Bhuj has a number of relics of the past and ancient monuments. The Marine National Park at Jamnagar is a popular tourist point. Saputara and nearby areas have pleasant weather, scenic getaways, and have numerous outlets of local crafts. Not to miss, Dwarka is the Land of Krishna Devotees and is known for its religious and cultural heritage. Oweing to the rich history and heritage of Gurajat, there are number of sites that tourist visit to relive the bygone era. One such is the Rani ni Vav, located on the banks of the river Saraswati, this step-well is a UNESCO World Heritage Site. The seven-storeyed step well’s design mimics that of an inverted temple. The site features various images of Gods and Goddesses, that to even this day are worshipped by the locals and travelers. The delicate work on the walls, columns, and roofs are shining examples of traditional architecture and art forms. 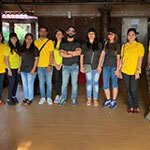 Champaner-Pavagadh Archaeological Park, is other popular place to visit. In the 16th century, Champaner was the capital of Gujarat. Today the town is almost abandoned. The ruins of this ancient town are a UNESCO World Heritage Site and houses various heritage building such as the famed Pavagadh Temple and Jama Masjid. The design of these buildings are a perfect blend of different architectural forms. Old Ahmedabad, it itself, is a UNESCO World Heritage City. The city comprises of what locals call Pols, gated societies where members of different communities live. Old Ahmedabad has numerous havelis that are known for their exquisite wooden architecture. 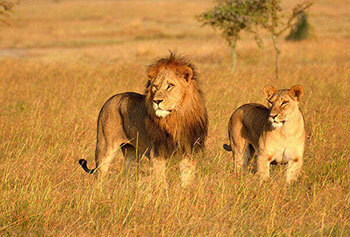 Owing to its location and different climatic conditions, Gujarat is blessed with a wide range of flora and fauna. The forests in the state can be classified into three types: Moist deciduous forests, thorny forests, and dry deciduous forests. These forests are covered with banyan, neem, red silk cotton, tamarind, and peepal trees. The forests are home to a number of animal species such as Asiatic lions, black bucks, nilgais, chitals, wild boars, and hyenas. Many bird species such as White Fronted Dongo, Wheatear, Black Necked Stork, and Hen Harrier, over the years, have made the forests of the state their home. 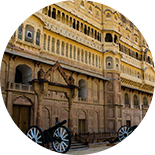 History of Gujarat stretches from the age old Harappan Civilization to the Mughal era. The endless journey of this state glorifies its present. Gujarat is abode of many Religious Spots that have attracted pilgrims from far & wide. 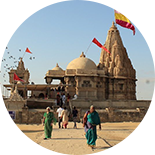 The Somnath Ji Temple, is one of the twelve Jyotirlingas and is a prominent pilgrimage site for Hindus. The seven storeyed temple’s design is a shining example of traditional Chalukya architecture. The Dwarkadhish Ji Temple, located on the confluence of the Arabian Sea and Gomati, is dedicated to Shree Krishna - an incarnation of Lord Vishnu. The floors of the sandstone temple are supported by 60 columns with artistic carvings. The Bala Hanuman Ji Mandir towards the southeastern side of the Ranmal Lake, this temple is dedicated to Lord Hanuman, the Monkey God. The temple is visited by several Hanuman devotees round the year. The world known, Swaminarayan Akshardham Temple at Gandhinagar, is dedicated to Lord Swaminarayan and believed to be his abode. 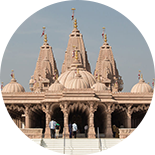 The sprawling 23-acre temple was made from pink sandstone. The temple complex has a seven feet tall gold plated statue of Lord Swaminarayan. Other attractions in the temple include, a water show, organized after sunset, a waterfall, a park for kids, a lake, and gardens. The Sun Temple at Modhera, is famous for its unique architecture. The temple is built in such a way that the sun rays fall directly on the image of Surya chakra inside the temple from sunrise to sunset. The main hall includes pillars that feature artistic carvings and sculptures. 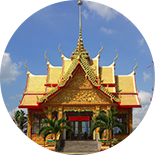 The temple complex also houses temples dedicated to other Gods and Goddesses and step-wells. 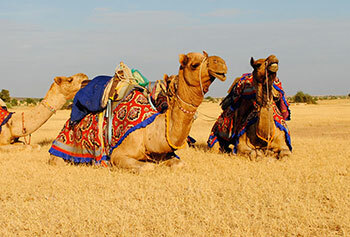 Gujarat is known for its vibrant and colorful culture. The locals are happy go lucky people who love celebrating life and this state celebrates more than 2000 Fairs and Festivals. The major fairs and festivals celebrated in different parts of the state are Rann Utsav, International Kite Festival, Bhavnath Fair, Navratri, Uttarayan, Paragliding Festival, Bhavnath Fair, Modhera Dance Festival and Sharadotsav apart from, mahashivratri melas, modhera sun temple festival and other local religious festivities. Gujarati cuisine primarily consists of traditional vegetarian delicacies such as dhokla, pathra, khichdi, and samosa. The state is known for its traditional thali that consists of rotis, dal, kadhi, rice, and veggies. The locals are known to have a sweet tooth and often indulge in traditional sweets such as mohanthal, jalebi, and doodh-pak. 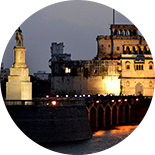 With every city having something unique to offer, Gujarat is a shopper’s paradise. Ahmedabad is the best city to shop for traditional mirror work and outfits. Surat is famous for its export quality sarees, whereas Rajkot is the favorite shopping destination for those who want to buy items that showcase local arts such as different forms of beadworks and silk embroidery. Here you can also shop for gold and silver wares and show pieces. Jamnagar has various markets lined with shops that sell designer paperweights, betel nut crackers, and brass enclosed wooden torsos. 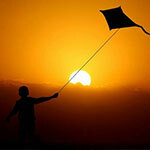 Gujarat experiences three major climates: Summer, winter, and monsoon. Winters are pleasant for a tour. Interestingly, Gujarat has more airports than any other Indian state. All the major cities such as Bhavnagar, Ahmedabad, Surat, Vadodara, Rajkot, and Bhuj have airports that connect them to the rest of India via air. People here are warm and welcoming. They take pride on their state and are very helpful to tourists. Nevertheless, we as your travel partner will put in every possible effort to ensure a safe, comfortable and memorable holiday in India.